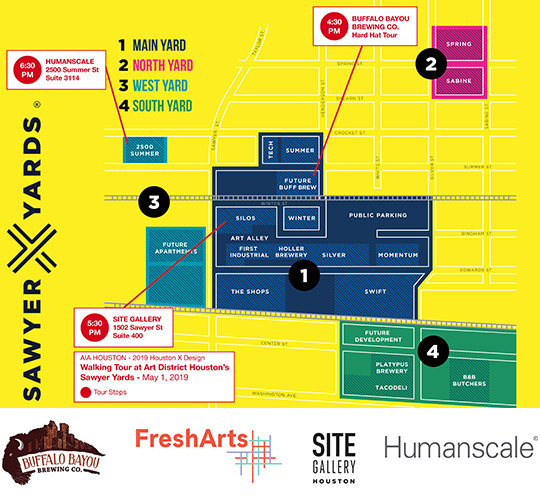 Join us for a Walking Tour at Arts District Houston's Sawyer Yards! Located in the heart of Houston’s historic First Ward, Sawyer Yards is a mixed use development consisting of art studios, creative businesses, public galleries, unique dining and entertainment venues. With an active railyard as its backdrop, this complex utilizes abandoned industrial warehouse as venues for creativity and commerce, all brought to life through an active schedule of special events. This AIA Interior Architecture Committee HoustonXDesign event will provide an overview of this dynamic community. Tour will begin at site of Buffalo Bayou Brewing Company (see map above). 4:30 pm – Introduction to the Arts District Houston by Marci Regan Dallas, Executive Director of Fresh Arts. This will be followed by a hard hat tour of the new home of Buffalo Bayou Brewing Company by founder and CEO Rassul Zarinfar. 6:30 pm - Happy Hour and refreshments at the Humanscale showroom at Summer Street Studios hosted by Kate Detiveaux. Download an event map HERE.